Poseidon was god of the sea, earthquakes, storms, and horses and is considered one of the most bad-tempered, moody and greedy Olympian gods. He was known to be vengeful when insulted. He is the son of Cronus and Rhea and was swallowed by his father along with Hades, Demeter, Hestia and Hera. However, in some folklore stories it is believed that Poseidon, like Zeus, was not swallowed by Cronus because his mother Rhea who concealed him among a flock of lambs and pretended to have given birth to a colt, which was devoured by Cronus instead. After the gods defeated the Titans, the world was divided into three and Zeus, Hades and Poseidon drew straws to decide which they would rule. Zeus drew the skies, Hades the underworld, and Poseidon the seas. There is only one reference to this divide, by Homer in the Iliad. Poseidon was most notably the God of the sea and the protector of all waters; sailors relied upon him for safe passage. Poseidon was allotted his dominion after the fall of the Titans. Zeus and Hades were his brothers. It stands to reason that, because of his influence on the waters, he was worshipped in connection with navigation. Poseidon was worshipped as a fertility god. He wielded the trident or three-pronged spear, and this image of him is reflected in art. Poseidon possessed a palace, made of gems and coral, located on the ocean floor. He was at Mount Olympus more often than his palace. Poseidon was moody by nature: his temperament was unstable at best, and his emotional fluctuations often resulted in violence. 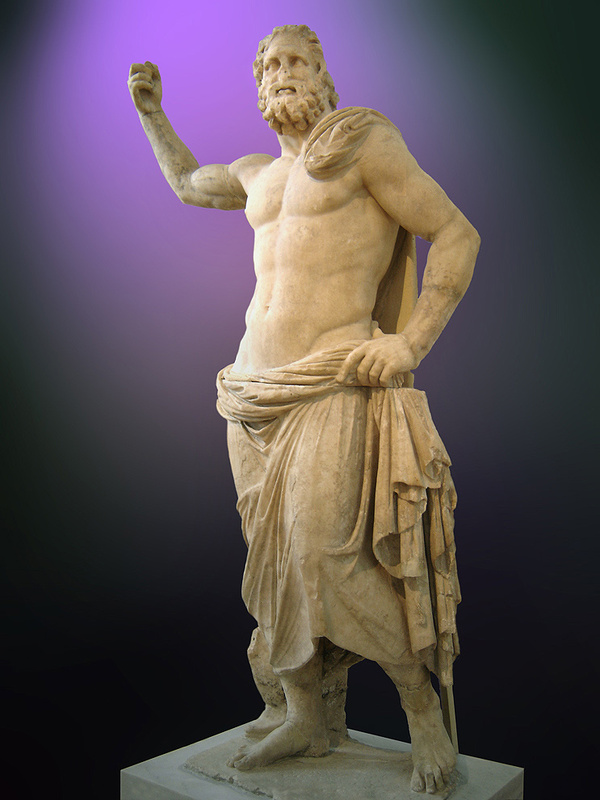 He was similar to Zeus in that he liked to exert power over women and flaunt his rugged masculinity. At times, however, his efforts were appreciated. Poseidon saved Amymone from a satyr. His primary means of transportation was a chariot pulled by horses. Poseidon assisted the Greeks in the Trojan war. However, Zeus commanded him to withdraw from the battlefield, and he reluctantly obeyed. His grudge against Odysseus is one theme in the Odyssey. Poseidon was the husband of Amphitrite, a Nereid. Their union produced Triton, who was half-human, half-fish. He and Medusa conceived the flying horse, Pegasus – one of many mythological creatures. He was also the biological father of Orion, Polyphemus, Pelias, and many others. One of his most notable dalliances involved his sister Demeter. She refused his advances by turning herself into a mare. He then transformed into a stallion and pursued her. Their relations produced a horse, Arion. He and Athena competed for possession of the city of Athens. To sway the people in his favor, Poseidon made it spring at the Acropolis. Athena, on the other hand, gave them the olive tree. With it, she won the contest. Despite Poseidon’s connection to chariots and ships, Athena was the first to make one of each.